Warning: The following recipe contains a seriously spicy ingredient! Do not continue reading if you do not have a glass of water or calming avocado nearby! Saturday afternoon, while at the new Whole Foods in Plymouth Meeting, PhillyBoy and I decided we wanted to stay in that night and cook at home. I had recently received a jar of Chile Crunch to review and I knew I wanted to base dinner around it. 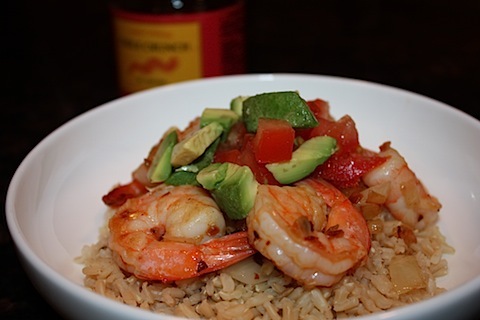 The ingredient list forming in my head included shrimp, brown rice, and avocado. I wanted to make a dish that balanced all sorts of flavors and textures, and this dish did exactly that. Chile Crunch is sold over on Foodzie, which according to the website, is “an online marketplace where you can discover and buy food directly from small passionate food producers and growers.” I was first introduced to Foodzie at the Foodbuzz Festival in 2009, and I have supported it ever since. If you look to the right of this post you will see all of my favorite Foodzie products, which are available for sale on their website. I love the idea of helping small producers reach a larger audience through this site. Chile Crunch is not a product I would ever think to buy, and I am glad I had the opportunity to review it. 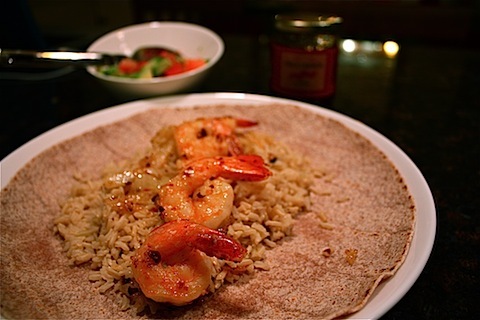 It is extremely spicy and crunchy and made the perfect marinade for the shrimp in this dish! 1. Make brown rice according to directions (for me, this means bringing 2.5 cups of water to a boil, adding 1 cup brown rice + dash of salt and cooking, covered, for 35 minutes. Let it stand for 5 minutes and then fluff with a fork and serve). 2. Meanwhile, heat one tablespoon of olive oil over medium in a wide, shallow skillet. Add the chopped onion and sweat for 10 minutes until soft and translucent. While the onion is sweating, mix the juice from one lemon with 3 tbs of Chile Crunch with oil in a large bowl. Add the shrimp and toss well to coat all pieces. 3. When the onion is done, remove it from the skillet and turn the heat to medium high. Add 1/2 the shrimp in a single layer. Do not move the shrimp once you place them in the skillet. When the underside is pink (about 2-3 minutes) flip each shrimp. I use tongs for this. When the shrimp are cooked through (about another 3 minutes) remove and repeat with the second half. 4. When all the shrimp are cooked add them and the onion to the skillet for a minute or two to heat up. This is a dish I can’t wait to make again. While it used a couple of pots, it was worth the end result. Please try it and let me know what you think! ***Don’t forget to enter my delicate soles giveaway!! Looks good, I had a very similar dinner tonight! Love that top photo of the shrimp! Beautiful photos and looks like a delicious dish! YUM! I love that first photo of the shrimp! He looks like he is doing Pilates! I think I just discovered my new favorite site –> foodzie.com! Heh heh heh! I got that chile crunch, too! I ate it straight up! It’s not that hot, actually. I LOVEd it! Wow, that meal looks really, really good! I might try making it with a slightly mild sauce, though. It sounds like it would still be tasty without a super hot sauce. Looks so delicious! I can’t wait to try this recipe. I love shrimp and anything with a spicy kick! I love that little shrimpy sitting there on the plate! Mmmm I will have to look into the crunch, my husband LOVES spicy food so this sounds right up our alley! Holy Moly – amazing recipe! Have a great week, Sabrina! That shot of the shrimp standing up by itself is fantastic, amazing job! Sounds nice & spicy! 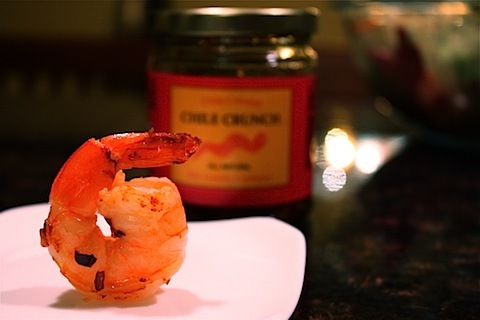 I will look for this Chile Crunch and can’t wait to give it a try!